The British Army, more so than many others, has preferred wheeled vehicles for many missions and used a plethora of them in WWII – armored cars, scout cars, reconnaissance cars, and security vehicles of varying mobility and firepower. After the war they took their time finding suitable replacements for the WWII vehicles. The big winner here was Alvis, who designed a complete series of vehicles that were numbered in the FV600 series. 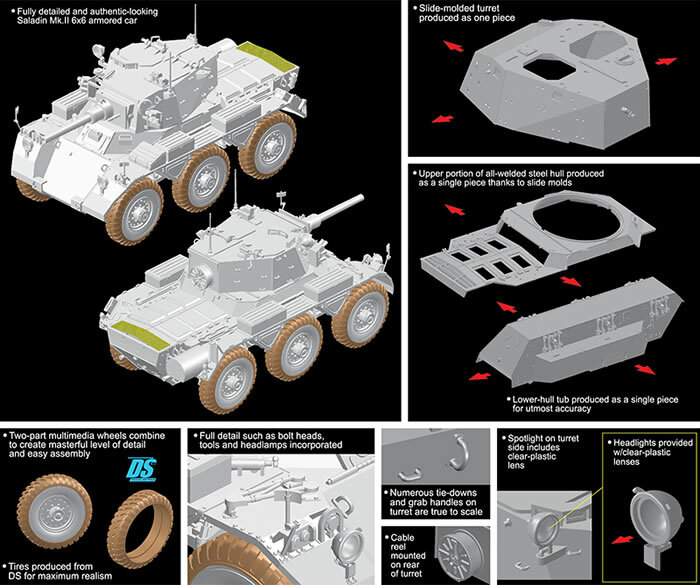 The armored car member of the family, the Saladin, was FV601 and used the same 6 x 6 chassis to all of its relations. It was a compact vehicle with a Rolls-Royce V-8 gasoline engine and sufficient fuel for a road range of 400 kilometers, armed with a 76mm short gun and two .303 machine guns (later 7.62mm), one coaxial and one free mount on the turret. Protected by 16mm armor and able to fire either HESH, HE or HEAT ammunition, it was a very capable machine when introduced in 1958. 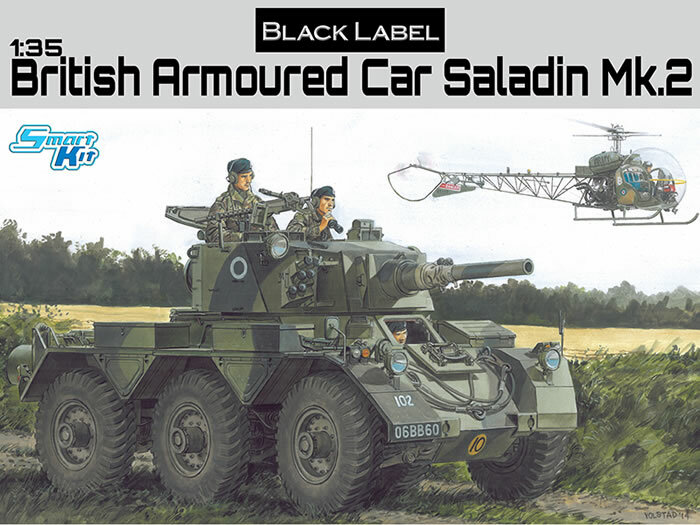 Over its 14 year production run 1,177 Saladins were built and wound up in the armies of some 36 countries, with their most recent usage being in 2009. Most Americans probably last remember them as part of the Kuwaiti defense forces in 1990 valiantly trying to fight off Iraqi T-72 tanks as seen on their TV screens. 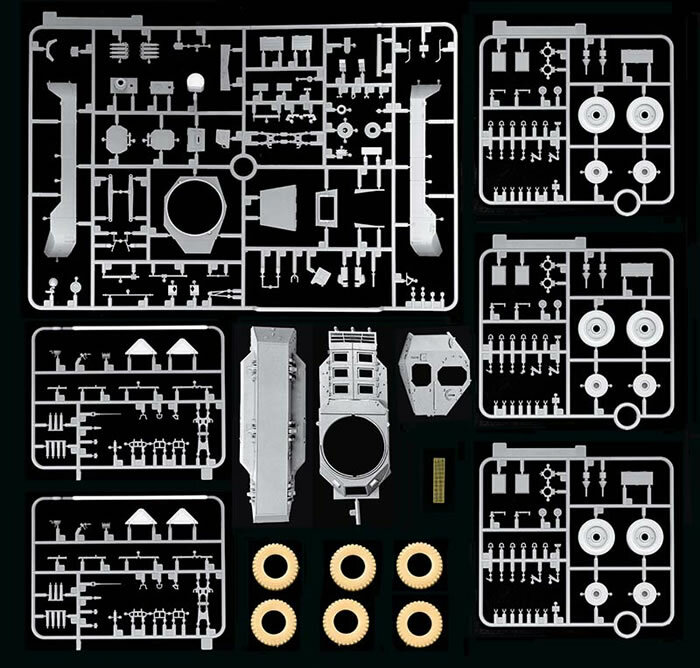 The vehicle has always been popular with modelers but not model companies. The only two styrene kits of this vehicle up until now have been a very bad and very ancient one from Tamiya (sized for a motor package and not scale per se) and an HO one from ROCO. Resin kits have been around for several years, but this kit is the first new mold version of a Saladin to hit the market. DML at least asked two highly knowledgeable people about the Saladin: Ken Jones, editor emeritus of “Military Modeling”, and Peter Brown, editor emeritus of the “Track-Link”. The result matches all of my references for the vehicle, and as noted above is very petite compared to the Tamiya kit of years gone by. It come with a two-piece hull (upper and lower) so that in theory an FV603 Saracen or FV620 Stalwart could also be coming behind it as they all share the same drive line and components. The model uses DML’s successful wheel system of a DS plastic tire with no mold lines to speak of and a styrene backing plate and rear section, which gives the best overall representation of the tires and wheels. While most of the hatches are separate components, there is not a bit of an interior in either the hull or turret, so the latter will need figures or some work to fill the openings if the hatches are left open. The very beefy suspension is nicely done so that the parts are “ganged” together - four shock absorber/spring unit at each corner and three per side in the center. The fender units are built up from elements and components but the stowage bins are sealed. The turret hatches may be permitted to operate if the modeler so desires but as noted there is no interior in the turret nor is there any interior face to the hatches. The latter is surprising in this day and age and I am sure some enterprising after-market company will address that with a detail set for this kit. The smoke projectors all are provided as separate parts and each cluster consists of some nine parts. The only etched brass part in the kit is the grill screen for the rear vents in the hull. Six different finishing options are provided: B Sqn 1 RTR Cyprus 1975 (black/green with number plates); “British Army” (black/green with code 31 and number plates); Queen’s Royal Irish Hussars, Brunei 1963 (black/green with code 31, crossed scimitars and number plates); A Sqn Queen’s Own Hussars, 1966 (green overall, unit insignia, number plates); B Sqn 3 RTR Sharjah, Persian Gulf 1968 (sand/green, unit insignia, number plates); B Sqn 3 RTR Sharjah, Persian Gulf 1968 (sand/green - different scheme, unit insignia, number plates). A small but very busy Cartograf sheet is provided for the markings. Overall this is a nicely done kit, but a few more details would have been appreciated for the price.